Chimichurri is a tasty Argentina based sauce that is used to flavor meats, eggs, and vegetables. It also makes an incredible marinade. 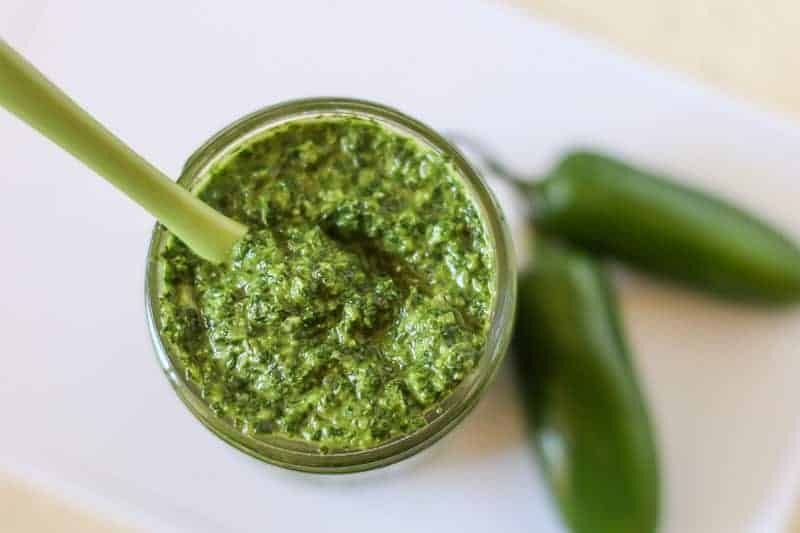 This Jalapeno Chimichurri Sauce Recipe spices up the traditional version. 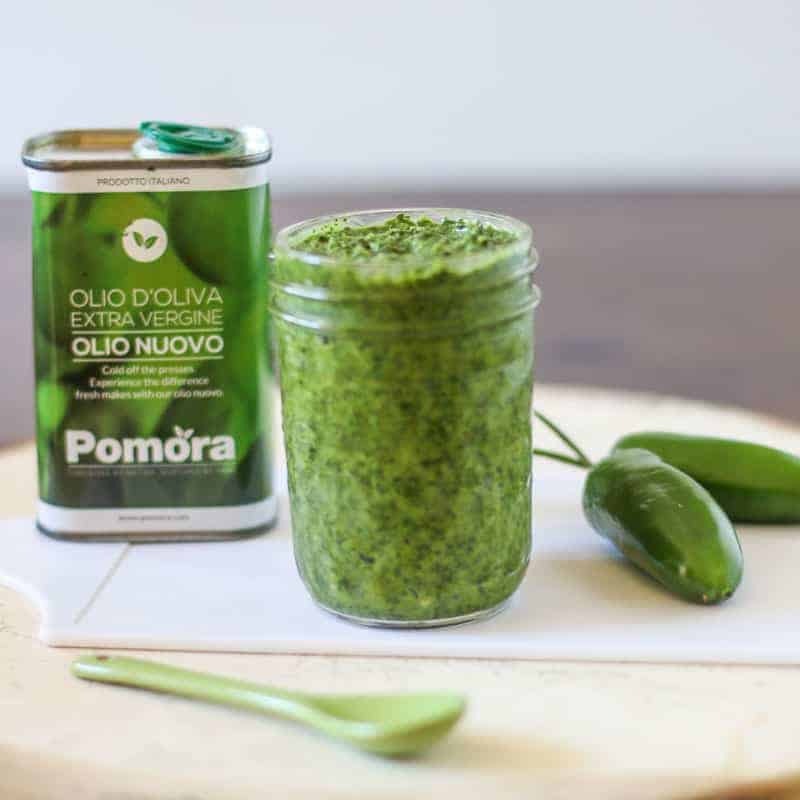 UPDATE: Since this post was written, I loved the Olive Oil so much, I have partnered with Pomora. This post now contains affiliate links. I receive a small compensation for any orders placed with no additional charges to you. 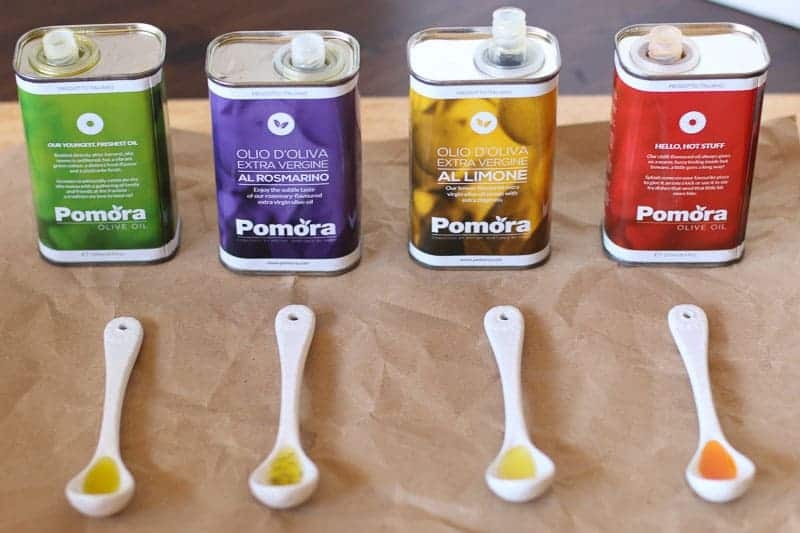 Pomora recently contacted me to try their olive oil and give my honest opinion of it’s taste and quality. They sent me an assortment of their current olive oil selections to cook with. I was not compensated for this post. I am a big olive oil lover, so I thought, “Why not?” After reading about the company, I knew this was going to be really good olive oil and I don’t pass up an opportunity for really good olive oil!!! 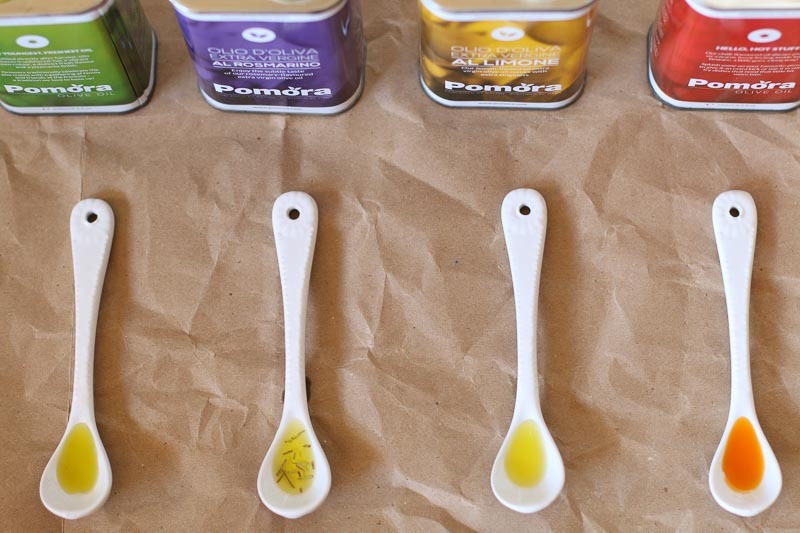 With Pomora; you adopt one of their olive trees from one of their award-winning growers – Carmelo from Sicily or Antonio from Campania. You will then receive an Adoption Pack with a certificate showing your tree and a booklet of information about your tree. Quarterly you will receive a shipment of 3x250ml tins of oil from your tree alternating between a plain oil quarter and a flavored oil quarter. Pretty cool? Yes? When I opened the can to pour it and try it, I was immediately impressed. This is the delectable extra virgin olive oil that poured out of the can. It was dense and thick with a beautiful color. It had a mild earthy smell. And the taste…. It was rich with a soft spicy bite at the end. Music to my taste buds. It really is INCREDIBLE!! I was immediately addicted to this stuff. 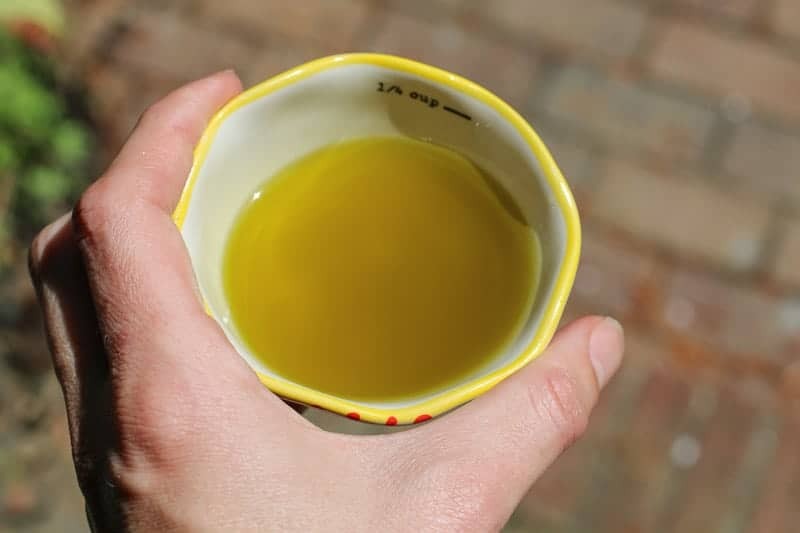 I wanted to try it on everything, from cheese, to bread, to tomatoes… I texted my blogger friend as I was tasting this incredible olive oil saying, “Oh my gosh! This olive oil is so good!” Foodies always have to share with another foodie when they are trying something AMAZING. So if I am going to be very honest with you, I have to make a confession. Pomora also sent me three of their flavored oils. After sampling the plain extra olive oil (not plain at all but it isn’t flavored so I lack a better descriptive word), I wanted to stash those other cans and save them for special occasions. I knew if I opened those other cans they would disappear in my household quickly. I am not the only lover of olive oil in my house. But alas, I knew that would not be fair to Pomora or to you if I didn’t taste them and let you know how they turned out. I have such a tough job. I know you feel sorry for me. With a bit of trepidation, I poured each of the flavored oils to try them out. OH! MY! SWEET HEAVEN! The rosemary flavored olive oil had bits of real rosemary mixed in with it. The rosemary was not overpowering as some infused rosemary olive oils can be. It had a nice balance of aromatic earthiness with a robust flavor. It would be amazing over bread and cheese; or drizzled over lamb or pork. 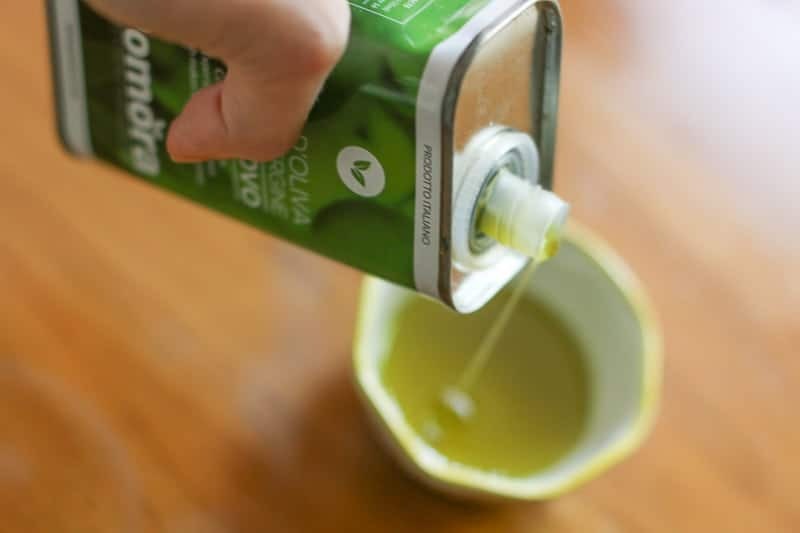 The lemon olive oil was soft and luscious with a cheerful yellow color. It did not have that “fake” lemon taste that some lemon infused oils have nor was the lemon too strong. It would incredible over a salad. It would be a lovely finishing touch to fish, pasta, or roasted vegetables. The chili olive oil was my favorite. You know I love all things spicy. This chili flavor really pushes thru with a mild bit of heat to follow each bite. My taste buds were going crazy over the combination. The pretty light red/deep orange color, the peppery smell, the rich chili taste, the ending finish of heat…. PERFECTION. This olive oil will rock your world if you like spicy food. Honestly, if you had a really good quality pasta and drizzled this chili olive oil over it; added in a bit of real freshly grated parmesan cheese, and topped it with salt and pepper; you would have one amazing dish. The chili oil is so packed with flavor, you don’t need to add much to it. But it would enhance a homemade red sauce or white wine sauce. Oh my gosh… now I want to go make a white wine sauce with this olive oil and add in capers, garlic, fresh tomatoes, maybe a bit of fresh squeezed lemon……I digress. THIS STUFF IS GOOD. ALL OF THE OILS ARE GOOD! If you are a foodie, ORDER THIS OLIVE OIL. If you know a foodie, THIS MAKES THE PERFECT GIFT! In fact, if you want to add me to your Christmas list, I would love some more. Hint, hint friends and family. The olive oil is almost too good for every day cooking. But because it is so good, you will want to use it in everything…. 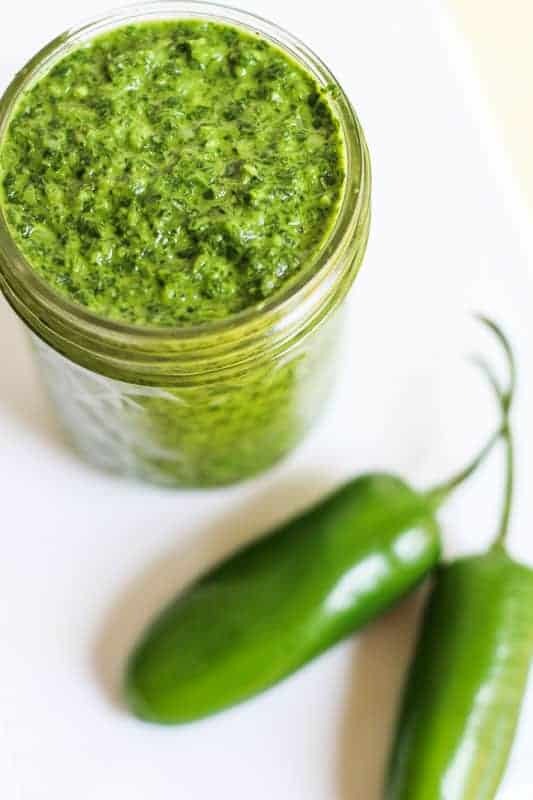 So today I am sharing with you my Jalapeno Chimichurri Sauce Recipe. This jalapeno chimichurri sauce recipe adds a kick to lamb, steak, chicken, pork, shrimp, potatoes, and roasted vegetables. I sometimes even make Baba-Ganoush and add this to the top of it for a finishing touch. I just love this stuff. If you like this recipe, check out: Creamy Parmesan Salad Dressing, Blue Cheese Compound Butter, and Jalapeño and Garlic Relish. Chimichurri is a tasty Argentina based sauce that you can use to flavor meats, eggs,& vegetables. This jalapeño chimichurri recipe adds in heat. Pulse until all ingredients break down into a sauce consistency. Store leftover sauce in air tight container for up to 1 week in refrigerator. I don’t think so. I think it would be fine. Would it be too much to use jalapeño infused olive oil in this recipe since it already has jalapeño in it? That is so cool! I want to adopt my own tree, too. But first, jalapeno chimichurri sauce. Yum! I sure do love good olive oils. I just ran out of this beautiful lemon infused oil that was so amazing! I’m now using an thick orange infused olive oil that is also a lot of fun. I’m so spoiled I can’t even buy the cheap grocery store brand anymore. Okay, that oil looks really good! They look so rich and you can literally see the flavor. Yum! I’d totally fry up some crispy breakfast potatoes in the chili oil too 🙂 Hey, who is the blogger friend you texted? lol! That olive oil sounds amazing and love the varieties! There’s local oil and vinegar place that I’ve been meaning to check out forever and you’ve inspired me to do so! I’ll have to keep my eye out for this brand too (I’m an olive oil lover too). 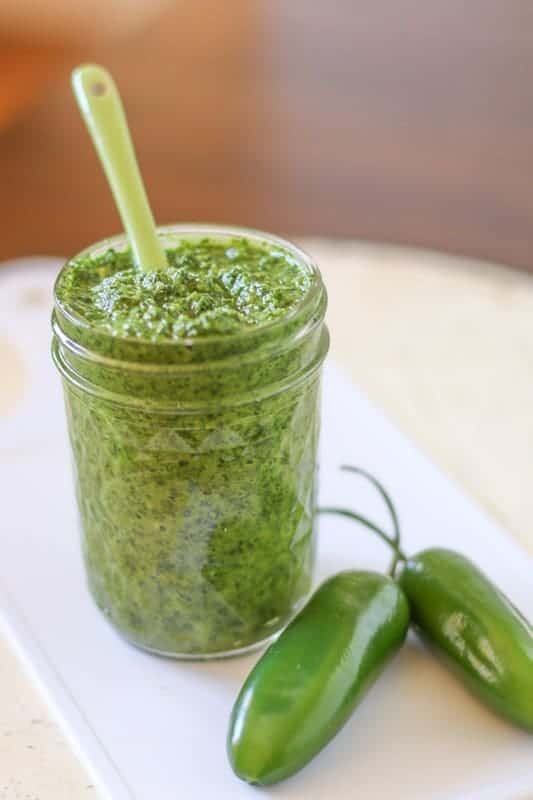 This jalapano chimichurri sauce looks (and sounds) totally delicious. That colour! What a lovely thing to top steak (or anything for that matter)! Pinned! Happy Monday!